China's Alibaba starts selling stakes in its Cayman Island company Alibaba Group Holding Limited today in the United States. In a "Letter From Jack Ma" which was filed last Friday with the Securities and Exchange Commission, Ma "Jack" Yun outlines expectations, caveats, and hopes for armchair investors in his extended family of Chinese e-commerce businesses. Much of the letter is normal call-to-arms for both employees and investors to drive Alibaba to continue having great leaps forward. But we want to focus on the most important part of Alibaba's business that is not directly discussed in the letter, but which any investor, employee, or China-watcher need be aware: the Chinese government is the most important stakeholder in Alibaba's past and future. And the Chinese government and its regulations ultimately dictate whether investors will see sustained riches from Alibaba after its initial public offering later this month. Jack Ma says the company has had to "make difficult choices among competing interests… between entrepreneurialism and regulation". Herein lies the only tangible nod towards the government. And he omits the importance of the government altogether when he says, "I have said on numerous occasions that we will put 'customers first, employees second, and shareholders third.' I can see that investors who hear this for the first time may find it a bit hard to understand. Let me be clear: as fiduciaries of the company, we believe that the only way for Alibaba to create long-term value for shareholders is to create sustainable value for customers. So customers must come first." The government should be first, second, and third, with the rest of the list coming in distance fourth. Why is the government not named as the most important stakeholder? Part of this is the obviousness — from the Chinese side — that of course the government is the most important and burdensome driving force in how a business develops. Why state the obvious? And part of the omission of the government from the letter is that it scares away anyone not prescient of how businesses operate in China. 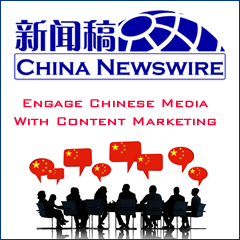 If you have the opportunity to attend business conferences in China dealing with corporate governance, corporate social responsibility, or sustainability, you will continuously hear that the Chinese government is the ultimate and foremost stakeholder in a growing business. It is the default setting for doing business in China, whether CEOs and investors consciously realize it or not. Having the government as the most important stakeholder is like a chronic illness with which Alibaba and other businesses have learned to live. But like a chronic condition, there are flare-ups that can compromise and hurt Alibaba's growth and investors' wealth. The most important potential flare-up comes from the variable interest equity relationship that Alibaba has with its operations in China. 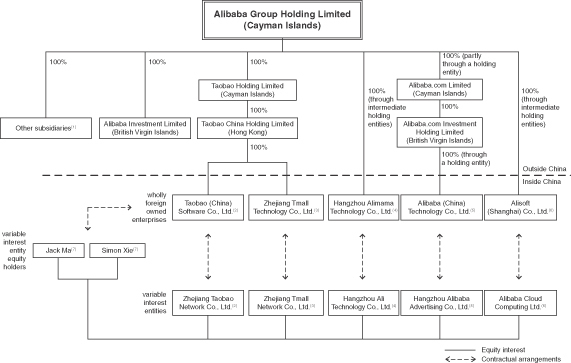 A VIE relationship is a contractual agreement that exists to enable a foreign company (in this case, Alibaba's Cayman Island company's subsidiaries) to benefit and book any revenue from a fully-owned Chinese company. Though the agreements are drafted by teams of lawyers, the agreements have virtually no legal standing in China — these are merely accounting agreements that allow the companies to book Chinese revenue as U.S. GAAP revenue in the United States. The dotted lines at the bottom of the chart signify the VIE relationships and lead to the Chinese businesses that ultimately generate the revenue, manage the products, own the intellectual property, employ the staff, and create value. These are dotted lines because they are truly not solid relationships. At any point, Jack Ma can legally — in China — separate any income-generating business from the Cayman company by voiding the VIE agreement. Would he ever do that? Most likely not. But if the government mandates that a certain business model can truly have no foreign connectivity, then Jack Ma's hand will be forced by the Chinese government. Recently Jack Ma severed the profitable Alipay online payment service away from Alibaba. This separation reportedly angered investors like Yahoo. But Alibaba claims that government rules forced the company to keep the financial services firm away from any direct or perceived foreign control. Don't forget that within the past decade, Chinese government mandates have sunk overseas-listed Chinese business models. Take a look at Chinese companies like Hurray, KongZhong, and Linktone and track how they tumbled after Chinese government rules limited these companies' abilities to derive revenue from mobile services. Why do VIE relationships exist? 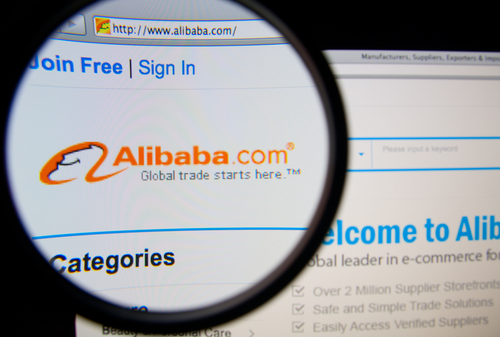 Because only 100%-owned Chinese companies can provide many of the technology and online services that Alibaba performs. Foreign companies can not provide online map services, so if they want to enter China they must sign a VIE agreement with a local firm. 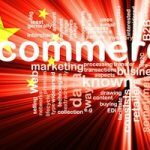 Foreign companies are not allowed to run most types of online payment services, so again if a company enters the market from overseas they must sign a tenuous VIE agreement with a local Chinese company. So the most important takeaway from Jack Ma's letter is not what it contains, but what it lacks. It omits an honest and forthright appraisal of the company's biggest potential problem. Yes, these problems are outlined elsewhere in the risks section of the company's F-1 statement, but those are templated and barely raise investors' blood pressure anymore. After all, almost every other Chinese technology company that is listed in the United States is also operating mostly via a VIE structure, so investors have already accepted the truly untenable. Adding to your point is the news that many top Chinese leaders and their families aim to gain big form the IPO! American investor money is funding the riches of the Chinese government elite!! VIE is a viable structure and acceptable to use so I'm unsure what nonsense you're stirring up by claiming it is illegal……. Every Chinese company like SINA, BIDU, SOHU, and NTES use this to great effect and there has never been an ounce of regret from investors.